According to a notification issued by the Cabinet Division on October 22, 2015,2 Lt. Gen. (Retd.) Nasser Janjua has been appointed as the National Security Advisor (NSA) of Pakistan, while the ‘terms and conditions of his appointment’ will be specified later. Special Assistant to the Prime Minister, Dr. Musadik Malik, has also stated that the National Security Advisor’s roles and responsibilities were being drafted, and not yet finalized.3 The newly appointed NSA will be operating from the Prime Minister Secretariat, with reports of the National Security Division also being shifted there from the Ministry of Foreign Affairs. Another notification issued by the Cabinet Division on October 22, 2015 also stated that Mr. Sartaj Aziz, who had been serving as the Prime Minister’s Advisor on National Security, with the ‘additional charge’ of Foreign Affairs, has been designated only as the Prime Minister’s Advisor of Foreign Affairs. Lt. Gen. (Retd.) Nasser Khan Janjua is not the first high-ranking military official to hold the post of the NSA. Earlier, Maj. Gen. (Retd.) Mahmud Durrani was appointed by the previous PPP Government as the NSA and served for the period of April 2008-January 2009. Lt. Gen. (Retd.) Nasser Janjua was appointed as NSA within weeks of his retirement from the Army and relinquishing his post as Commander Southern Command. He has earlier served as the President of the National Defence University (NDU) as well. While in Balochistan, Janjua took to the microphone and media with a penchant unlike other serving officers. Mr. Sartaj Aziz, who has now relinquished the charge, is well-respected for his sound capabilities, scholarship and his meticulous and well-documented understanding of the issues of national security and civil-military relations, among skills in other statecraft. Institutionalizing the National Security Committee, a much-needed reform, goes to his credit at the start of the tenure of this Government. Unfair comments, quoting unnamed high-placed sources in the cabinet, have appeared indicating that it was due to the inability of Mr. Aziz to pay full attention to the post of NSA that a new NSA has been appointed. The lack of regular meetings of the NSC over the past two years apparently owe largely to the reluctance by the Premier to institutionalize consultations on national security that he appears to be taking in one-on-one meetings with the COAS or in other such meetings. Some sections of the media commentaries on the appointment fear this being“a sign of shrinking control of the civilian administration over national security which has traditionally been the military’s domain.” 4 Only time will tell whether the new appointment helps or hinders effective civilian role in security architecture of the State. National Security remains a critical responsibility of the elected civilian Government, one in which, as is the practice elsewhere, military leadership needs to be consulted. Janjua’s lack of civilian experience will hinder in him having the holistic approach to National Security an elected Prime Minister requires. On the other hand, he brings with him a rich and substantive military background to make positive contribution to security deliberations. 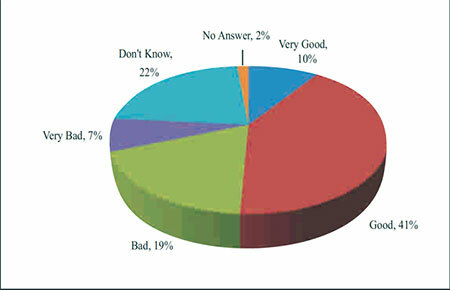 PILDAT believes critical revisions are required in the otherwise important NSC relating to its ‘decision-making’ role – which should be changed instead to a ‘consultative’ one – as well as the membership of the NSC where the Military Commanders should join the meetings as special invitees or advisors and not as full members. Apart from these required changes, it remains to be seen whether Lt. Gen. (Retd.) 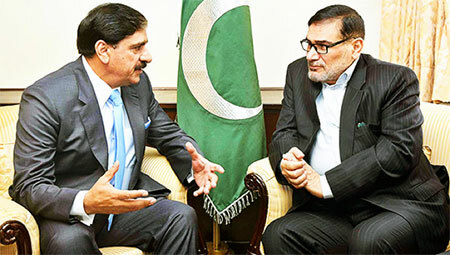 Nasser Janjua’s appointment as the National Security Advisor will spur the Committee into action, the last meeting of which was held on October 10, 2014.5 The macrocosm of Pakistan’s national security has surely become both complex and contradictory; Institutionalization in the formation of Apex Committees is accompanied by the dormancy of the National Security Committee; there is a National Action Plan to curb terrorism, but without any periodic institutionalized oversight of its implementation and without a holistic national security policy. It is a welcome development that we now have a full-time National Security Advisor. 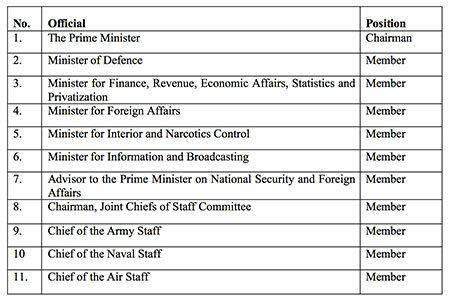 As a priority, the Parliamentary Standing Committees on Defence, both in the National Assembly and Senate, should convene meetings inviting the new National Security Advisor to share his plans as the NSA. The Committees also need to critically engage in regular oversight both of the NSC as well as the progress of the national security policy and implementation of the National Action Plan. The month of October 2015 saw a spate of foreign visits by the COAS including to the United Kingdom, Turkey and Germany where the focus remained reportedly on highlighting India’s military buildup, the stalled peace process with the Taliban, success in maintaining a peaceful environment after Operation Zarb-e-Azb, as well as a growing ISIS threat in the region. The COAS has often been seen in the forefront of various diplomatic efforts. October 01, 2015: Held interactions in the House of Commons; His Excellency Syed Ibne Abbas, Pakistan’s High Commissioner to the United Kingdom, also accompanied him. October 02, 2015: Met with United Kingdom’s Home Secretary, Ms. Theresa May in London. Composition of the Delegation: Apart from his personal staff, DG ISPR and DG Military Operations also accompanied the COAS Gen. Raheel Sharif on his trip. The COAS also highlighted the continued intransigence shown by India vis-à-vis Pakistan-India relations, and its negative impact on the region, all the while stating that Kashmir remained an ‘unfinished agenda’ and was the core of hostility in Pakistan-India relations. October 12, 2015: Visited the Kamal Ataturk Mausoleum in Ankara. October 12, 2015: Visited the Headquarters of the Turkish Land Forces in Ankara where he met with its Commander Gen. Salih Zeki Çolak. The COAS was presented with a Guard of Honour on the occasion, along with being bestowed upon the Merit of Legend. October 12, 2015: Visited the Keçiören Municipality of Ankara where a memorial in memory of the children who had passed away in the Peshawar Tragedy of December 16, 2014 had been made. Met with the Mayor of Keçiören Municipality of Ankara, Mr. Mustafa Ak on the occasion. Pakistan’s Ambassador to Turkey, His Excellency Mr. Sohail Mahmood also accompanied the COAS on the occasion. October 13, 2015: Called on the President of Turkey, Recep Tayyip Erdoğan. October 14, 2015: Met with Turkey’s Minister for Foreign Affairs, Mr. Feridun Sinirlioğlu. Composition of the Delegation: Apart from the DGISPR, the other members of the COAS’ delegation to Turkey are not confirmed. An increasingly positive public perception in this regard appears to be counterintuitive when compared with the real picture of Military’s increasing overreach in security and foreign policy affairs especially post the Dharna. The positive public perception, in this regard, may reside in the increased messages by the Federal Government of being “on the same page” with security establishment. This may also include the formation of the National Action Plan but also the various Apex Committees that have been operating at the Federal and Provincial Level.